$15 million in Series A funding before they had a product. 1 new product every month. And what’s the one big reason? In this post we’re going to explore why brand is so critical in B2B SaaS, alongside how you can build a brand that will stand the test of time. And to do that, we’re going to peek inside Drift’s killer brand strategy to highlight what companies should be aspiring to when it comes to brand marketing. ► Chapter 2: What is Brand? ► Chapter 5: How do you measure Brand? ► Chapter 6: There Are No Short Cuts! In the world of B2B SaaS, we have reached a tipping point. The landscape is severely crowded. So crowded, in fact, that In every category imaginable there are hundreds — if not thousands — of companies competing for the attention of the same audience. Whether you decide to invest in your brand is up to you, but it’s the one decision that will ultimately make or break your SaaS business. Let’s start off with a short video. Chapter 2: What is Brand? "Your brand is every single touch point your customer has with you during their journey.” This is how Bill Macaitis, Slack’s former CMO, described brand during a recent interview. This definition truly emphasises just how encompassing your brand is. But let’s also take this moment to get a few things straight. Your brand is intangible, it has no form, and you as a company do not own it. You can help shape it, but ultimately your brand only exists in one place; people’s minds. Why was Slack so successful? It wasn’t because they built a great messaging tool or a viral growth loop. Sure, these things helped a heck of a lot, but they were successful because they built a brand, that in people’s minds, everyone loved. While your logo, tagline, website and pretty slide decks are key components of your brand, it’s only a fraction of the story. Your brand is how you write emails. It’s how you talk to your customers, position your offering, and communicate your key messaging. Your brand is whether you leave coffee-stained cups in a meeting room or if you choose to clean them up. It’s how you greet people. It’s the way you talk. It’s your story. It’s how you tell it. It’s the perception people have of your company in their mind. Your brand builds trust, and trust leads to sales. And ultimately your brand boils down to communication in all its glorious forms. “We write as if we’re talking to our friends over lunch. In a world where the balance of power has shifted from company to customer and commodity to experience, brand is vital. Chapter 3 explores this in more detail. If you were one of the first players to move into the SaaS space then you would have faced little to no competition. Let’s think about Salesforce. When Marc Benioff and his team launched in 1999 the fact they offered a cloud-based CRM was enough to stand out since they were the first to market. In short, SaaS was driven by commodities. Now, think back to the image of the current Martech 5000 landscape from the first video and you’ll see that the commodity itself is no longer enough. Not by a long shot. Nowadays we no longer buy commodities, we buy experiences. And the most important factor in how well you’re able to deliver that experience is your brand. This is how Drift sees it, and that’s exactly why their marketing is all about delivering a holistic experience around the brand promise of conversations. This investment in brand is what makes Drift stand out from its competitors, but more importantly, this is what enables Drift to be first in the mind. When Drift started their podcast, Seeking Wisdom, it wasn’t about generating MQLs or measuring the ROI of a marketing initiative. Instead, it was about sharing the conversations the Drift team had been having internally about personal development, being a better leader, and new ways of learning. They wanted to share these conversations with like-minded folk who were looking to level up and transform themselves, their work, and their companies. Led by CEO David Cancel & Marketing Director Dave Gerhardt — and backed by a superstar supporting cast; shout out to Amy, DHD, Elias and Michele! — Drift has built a community of visionaries who want to rewrite the existing sales and marketing playbook whilst simultaneously break Apple Podcasts with their 6 Stars Only reviews! “DC” & “DG” rarely talk about their product or new features, but the podcast format allows Drift to get in the heads of their listeners without distraction for 15 or 20 minutes per episode to help build that friendly, conversational, human, warm, and helpful brand. In addition to their audio offering, Drift repurpose their podcasts for YouTube and also create a lot of original video content. Their Office Hours series gives a sneak peek into what’s going on behind the scenes at Drift, which is going to appeal to both customers as well as potential employees. Remember, your brand is not just for prospective customers. It’s for everyone, and in the war for talent, a strong brand is going to be a key factor in your ability to attract amazing people who want to come and work with you. For some companies, growth is not limited by the ability to gain new customers, but the ability to hire the right people; don’t underestimate the role of your brand in recruitment. If Shakespeare were to pen a modern day drama about B2B marketing, then “to gate or not to gate” would be the question. If you discuss with anyone about B2B content marketing, then this topic will almost certainly come up sooner rather than later. You see, the entire B2B marketing playbook was built upon gated content as a way to convert anonymous strangers into precious contacts, which was a real game changer at the time. But the problem is, we as marketing and sales people ruined it (like we do with everything). We put forms where there shouldn’t have been forms. We put too many fields when we didn’t need to. We had eager sales people immediately make a follow up call five minutes after someone had downloaded a top-of-the-funnel content piece. Drift is all about conversations. Lead forms are not conversational. So what did Drift do? They killed all their lead forms overnight. But even for the Drift team this took some getting used to since landing pages were as much a part of marketing as cranberry sauce is a part of your Thanksgiving Dinner. However, “to gate or not to gate” are not mutually exclusive propositions. For Drift it makes sense not to gate content since their brand is about conversations. Opening up their content means more people coming to their website. More people coming to their website means more conversations using Drift. More conversations means more trust. More trust means more sales. More sales means more customers. More customers means even more conversations. More conversations means more happy customers. More happy customers means more evangelists of the Drift brand. I’m sure if you asked the Unbounce team for their opinion they would most likely have a different view since their business is built on landing pages. For the majority of us marketers, we need to understand there is a middle ground when it comes to gated Vs. ungated content. Sure, technologies like Drift are moving us towards a more conversational playbook that enables us to deliver these personal interactions at scale, but there is certainly a role for lead forms so long as they are used in the right place at the right time and don’t result in a UX tragedy of Shakespearean proportions (we will be writing a blog post on this soon, #staytuned). And whilst the Drift team aren’t able to call upon the services of The Bard of Avon, they do have The Bard of Boston to pen great content, such as the State of Conversational Marketing 2017 (yes, it’s ungated). Up until this point, Drift’s conversations have taken place via the podcast, on social, or through their own product. However, the best conversations take place face to face. With this in mind, Drift established Hypergrowth, their own conference as an extension of Seeking Wisdom to bring the community together for one full day. This event wasn’t about customer acquisition. It wasn’t about lead generation and crappy badge scanners. It wasn’t about being able to measure ROI and pipeline generated. It was about bringing people together, making conversations truly human, and fuelling a movement. In short, Hypergrowth was an investment in the Drift brand. Chapter 4: ❤️ Your Customer! Your offering can be a product or service, but it’s ultimately about delivering on the promises you made to your customers before they made the purchase decision. We’ve all had those experiences where we’ve bought something only to be disappointed that the reality didn’t meet our expectations. This will lead to a negative core brand experience. However, I’m sure you can remember those moments where you’ve received amazing customer service, whether it’s been at a restaurant or even picking up a hire car. There is a big opportunity to go above and beyond the call of duty, and how you deliver your offering will have a great effect, both positive and negative, on your consumer’s core brand experience. 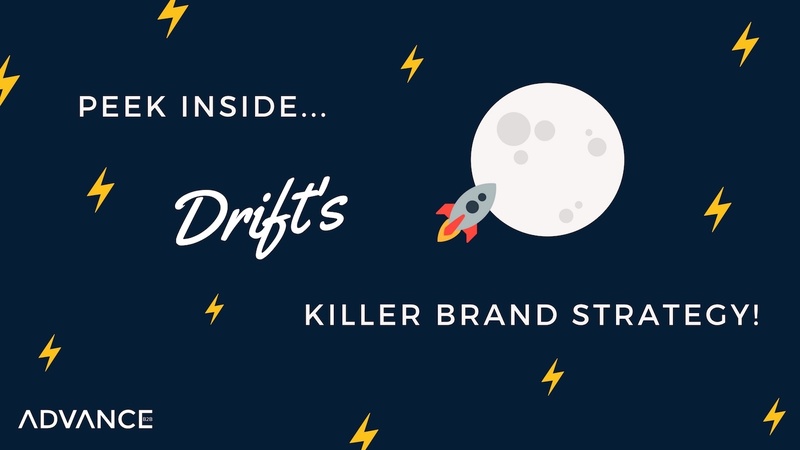 Let’s look at how Drift approaches their product and their customer service, and how these two factors help shape their core brand experience. The way software companies typically ship new products or features is to gather their community at a big, annual conference and release everything at once. Drift sees an opportunity here. By shipping a completely new product every month they hold themselves accountable to this brand promise, and it also allows Drift to break free from the competition. Drift Email was released at the beginning of October. Drift ABM came in early November. Drift’s next Marketable Moment is coming on December 5th, any guesses what i might be? At Drift, customer service is not the job of customer support or customer success; it’s everyone’s job. All employees will do customer support since the customer is the third and final key ingredient for Drift alongside product and brand. When it comes to service, Drift CEO David Cancel seeks inspiration from the most valuable brand in the world, Apple. They have even replicated the experience you get when visiting an Apple Store into the Drift sales process. However, when Drift’s new VP of Customer Success and Services, Julie Hogan, joined the team she noted that despite Drift’s perseverance of customer-centricity, there were few references to customers within the office. You might have seen the faces of DC & DG on the Seeking Wisdom cover art, in pictures on social channels, or around the Drift HQ, but Julie wanted to bring the customer to the fore. So her team added faces of their customers and their logos around their office to ensure they weren’t just talking about being customer-oriented but they actually lived it on a day to day basis. That’s what customer centricity is all about. Chapter 5: How do you measure Brand? In the era of the data-driven marketer, we feel a need to put a metric on top of everything we do; if you can’t measure it, you can’t call yourself a marketer. And sure, it’s super important to be able to track the performance of your work to understand how effective it is, but if you read some of the classic books on marketing, those that are 20+ years old but are still relevant today, you will be hard-pressed to find a chapter on topics such as conversion funnel optimisation. You will find chapters about how to tell compelling stories, how to position yourself in the minds of your customers, and how to make trusted connections with fellow human beings. So measuring brand performance at Drift is more of an art than a science. They are interested in word-of-mouth, looking at the compounding growth of their free product, recognising that on any given day some 5+ members of the Drift team will get an email that says “we love what you’re doing”. They look at what people are saying on Twitter, the number of 6 star reviews they receive for Seeking Wisdom (or 5 star reviews if Apple hasn’t fixed the bug), and they go with a little bit of gut feeling. But $15 million in funding before they had a product. Another $32 million in funding for good measure. I’d say these are pretty good measures of the Drift brand. Chapter 6: There Are No Short Cuts! Patience is a rare commodity in the modern world. We live in a time where we don’t just demand instant results, but expect them. This is why marketers have become obsessed with “growth hacking” with its heavenly promise of immediate results. Let’s get one thing straight, there are no growth hacks when it comes to brand. No silver bullets. No quick wins. No short cuts. DC refers to the promises of a “4 hour work week” or “5 minute abs” as examples of this obsession we have for instant results. And for us as marketers we cannot afford to make this mistake of becoming too short-term focused or too obsessed with the latest tricks and tactics that will give a short-lived inflexion to the growth-curve. When it comes to your brand, don’t waste time looking for a short cut, rather invest in taking the long cut. We don’t talk about the world’s most valuable products, tools or platform. We talk about “the world’s most valuable brands”. It always comes back to brand. And that’s why Drift isn’t building a business. Drift is building a brand. As we outlined at the top, we’re at a tipping point in the world of B2B SaaS. It’s all about experiences, and that means going beyond tactical inbound marketing, content marketing, and product marketing. Brand is the single, biggest factor in your ability to both stand out and stand the test of time. And that’s why we at Advance B2B, as a marketing agency specialised in working with SaaS companies, have launched our brand new brand marketing service. Strategy: Renewing your brand strategy so it is fully aligned with your business strategy. Perception: Rejuvenating your brand strategy to radically improve perception within the minds of your core audience. Differentiation: Reinvigorating your brand to stand out from the crowded landscape of competition. Let's wrap up with a final video.